Well, science has gone and solved one of life's most pressing questions. No, it's not what is love and/or the meaning of life (if there is any, according to Rihanna). It's a question that has been the root of many a friendly scuffle and romantic disagreement. It's a question so polarizing that even though factual evidence now provides an answer, both parties will continue to vehemently carry on this argument until their deaths. 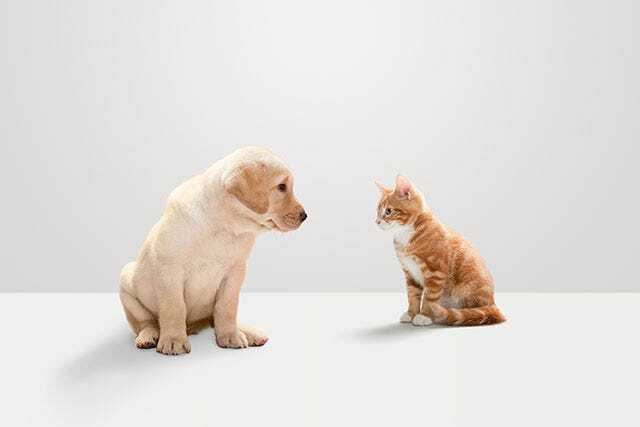 What defines a cat person and what defines a dog person? Somewhere in the back of the classroom, Science is raising its hand. According to a new study out of Carroll University in Waukesha, Wisconsin published in Live Science, cat people are more introverted and non-conformist. Dog people, on the other hand, are outgoing and rule-abiders. Oh, and cat owners can claim a higher level of intelligence than dog owners. Denise Guastello, the researcher responsible for carrying out the test, surveyed 600 college-aged students, asking them questions regarding their own personalities and how they pet-identified. Essentially, Guastello ran with the notion that humans choose their pets based on their own sense of self. "It makes sense that a dog person is going to be more lively, because they're going to want to be out there, outside, talking to people, bringing their dog," Guastello explained. "Whereas, if you're more introverted, and sensitive, maybe you're more at home reading a book, and your cat doesn't need to go outside for a walk." The whole study could use a bit of a wider demographic than college-aged participants, but science is science. This here author is sassily turning another cheek to the results because a love for Boo The Dog and a near obsession with wanting to own a dog just like Boo is not a reflection of intelligence. Taste? Sure. But, not brains.